... "Pegasus... Pegasus shake your legs" your radio crackles to life. You comply to indicate that you copy. "Very good", the voice continues, "now turn nine zero - ninety degrees to your left and fly parallel to the ridge". You smoothly pull on your left toggle and your wing banks smartly to the left before you release the pressure on the toggle completing the maneuver. "You have open airspace Pegasus. Your landing area is at your 4 O'clock across the river bed... Happy flying!!!" A common eagle sails past eyeing you quizzically and all the sweat and toil of ground school is redeemed. Have you dreamt of soaring like a bird?...floating through the clouds high up in the sky? Well here's your chance to fulfill that dream. It's the closest you will come to flying like a bird. 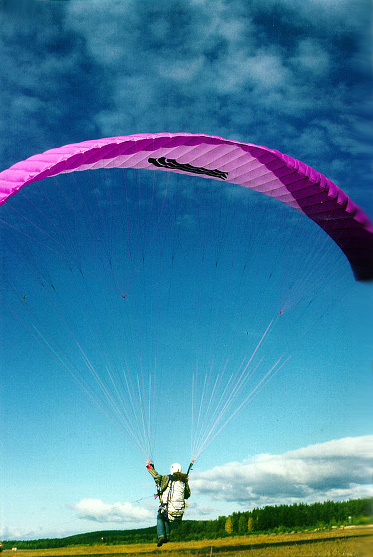 Paragliding is a gentle adventure and by far the latest and easiest way to achieve man's age old quest for free flight. Just about any one can learn this sport, no previous experience is necessary except maybe, a sense of Adventure to make your dreams come true! Come fly with 309 AirBorne. For costs and package details on our courses, holidays, weekends and tandem flights contact us.